Night-time in Australia, animals are waking, people are exploring, discoveries are being made – under the Southern Cross. What makes ribbons of colour swirl in the sky? What are the spooky balls of light that bounce across the outback? What animal lays eggs that look like squishy ping-pong balls? Where can you watch a movie with bats circling overhead? Discover the answers to these questions and more in this factastic picture book tour of Australia after dark. 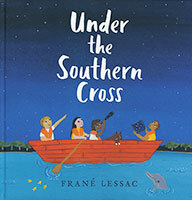 Frane Lessac is an internationally bestselling and award-winning picture book author-illustrator. Companion to A is for Australia (2015) and A is for Australian Animals (2017). Each spread has a short lyrical verse about the location, as well as a few additional factoids. The end matter will include a map showing all locations.